With savings of 25 to 65 percent, the 130 stores at Las Vegas Outlet Center include Coach, Liz Claiborne, Calvin Klein, Nautica, Nike, Reebok, Levi's, Danskin, Adidas, Greg Norman, VF Outlet – Vanity Fair Wrangler Lee. 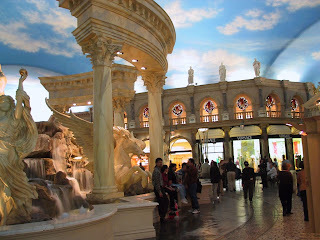 This indoor mall, complete with two food courts and an indoor carousel, is located on the southern end of the Strip. Come and visit the first master plan Chinatown in America. See the unique Tong Dynasty Architecture with the largest collection of Asian businesses in Las Vegas to meet your every fancy. Nine great restaurants in one location, each one serving Las Vegas's most authentic Asian food. Come and enjoy the many arts and crafts shops and the only Chinese bookstore in Nevada. You'll also find the largest Asian supermarket in the city, a well stocked herb shop, a Jade store and a Jewelry shop and many other retail stores that will make you feel as if you've been in China for the day. Chinatown Plaza - a little part of China in your neighborhood! To complete your day, treat yourself to a relaxing and rejuvenating massage with one of the competent licensed massage therapists today. Soothe sore muscles and revive the body! Departure Time: Passengers will be picked-up from their hotel at approximately 9:45am, depending on the hotel location. Exact pick-up time will be provided at time of booking. Hotel Pickup: Complimentary pick-up service available from most Las Vegas Strip hotels. Please advise pick-up hotel at time of booking and call upon arrival in Las Vegas to reconfirm pick-up time. So come to Las Vegas and try this experience today, it's rated 5 stars, book your trip through http://www.mingleinvegas.com/ or http://www.youtovegas.com/ and save today.